The inspiration for a new object was “buńka” (pitcher) wchis is a jug for storing liquids. The inspiration for a new object was “buńka” (pitcher) wchis is a jug for storing liquids. The starting point for designers from AZE design was the fact that most of the items are still produced in pottery studios, using traditional craft techniques and is no longer necessary in modern households. However, craftsmen still produce traditional designs that perform decorative and collectible function today. So how to make that creations would come into being again in an easy way in pottery studio? The solution is minimal modification of the traditional “buńka” (pitcher) which will enable a complete change its purpose. 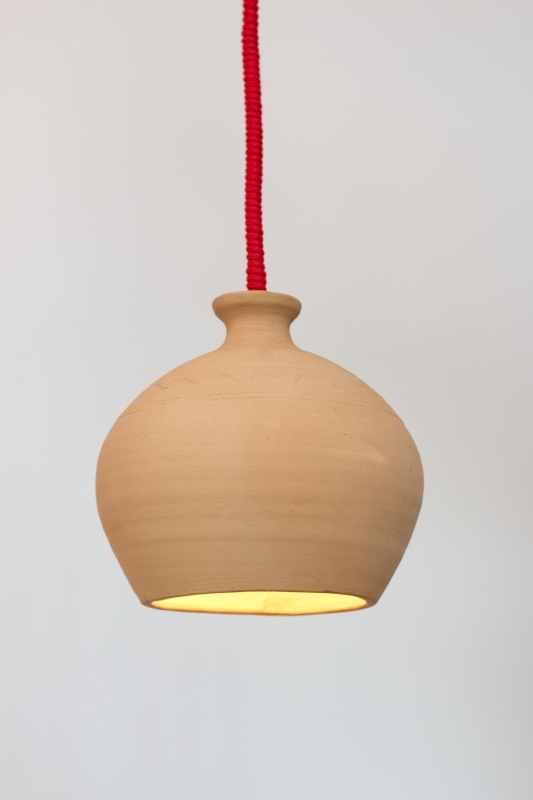 The traditional form of container without the handle and the bottom will become a shade for a hanging lamp. Purchaser will have an impact on the size of the object, the type of pottery firing and the final color. It will be possible to paint an item if its future user wants to change the nature of buńka- shade. Buńka – the collection of PME, the Basic Economy and Craft Storehouse. “Buńka” is a slang name for “bańka”(pitcher) - a jug with bulky belly and narrow, short neck. “Buńka” is a slang name for “bańka”(pitcher) - a jug with bulky belly and narrow, short neck. “Buńka” is a variation of an elongated jug with a distinct bulge of the belly, with similar diameters of the bottom and the edge of the spout with or without an ear. “Buńka” is made in many parts of the world and is used for storing and transferring liquids: water, oil, milk, wine, beer and beverage. The value of this form of the container with perfect proportion is its long duration (known from antiquity to the present day), Grey "buńka" - is one of the specialties of the pottery center in the Czarna Wieś Kościelna, like other black jugs (the color of gray and black is obtained in so-called reductive firing). These "ascetic" jugs have modest decorations in the form of scuffs and engravings. But “bańkas” have also more decorative forms: they are glazed and covered with decorative paintings.